A group is petitioning the Portland Harbor Commission to allow floating storage docks. 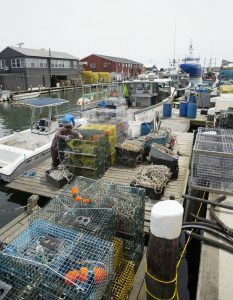 Lobstermen want to lease floating docks in Portland Harbor, claiming they have run out of affordable work space on the city’s increasingly gentrified central waterfront and need a new place to store and repair their gear. A handful of them are petitioning the Portland Harbor Commission for permission to install what would be the first floating storage docks on the waterfront. Current rules allow ship and boat moorings, but make no mention of storage docks. The modern-day struggle to defend the working waterfront from development dates back to the late 1980s in Portland when the first condominiums were built, said Tom Groening, editor of the The Island Institute’s Working Waterfront. That prompted a Maine constitutional amendment that allowed wharf owners to have their properties valued at less than their highest and best use, much like what is afforded to farm or forestland owners, to keep taxes, and thus rents, low, he said. The pressure is mounting as more developers seek permission for waterfront projects or are forced to lease waterfront space to restaurants after failing to recruit marine businesses. Buxton pays $6,000 a year for a 40-foot berth on Merrills Wharf, where he’s been for 20 years, and a place to park. His narrow float can barely hold all his gear. Rope bits, lobster totes and mooring chains often dot the sidewalk up above. His landlord tells him it does not sit well with the lawyers, developers and gastropub diners who began sharing Merrills Wharf with him after 2011, when zoning changes allowed the wharf owner to begin accepting non-marine tenants. 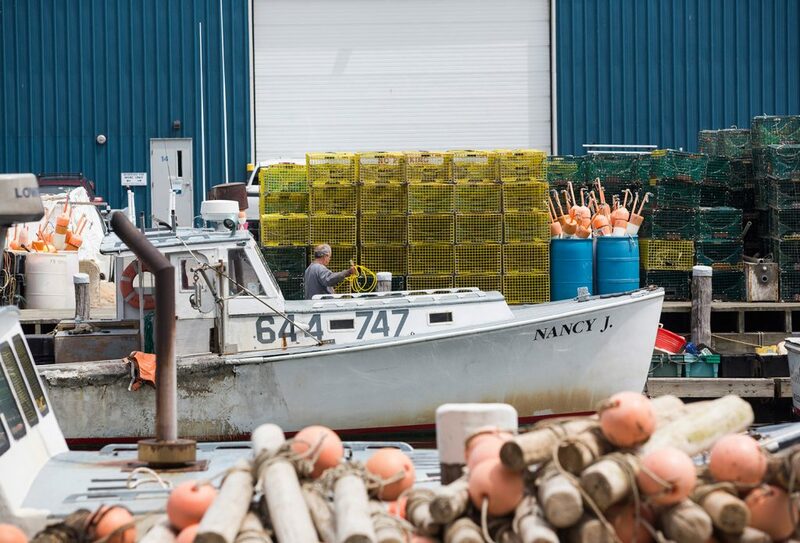 As white-collar businesses and tourists have flocked to the central waterfront, local lobstermen have seen unofficial workspaces disappear as tenants put up fences or started parking where fishermen once mended their nets. Buxton understands his landlord can make more money if he rents space to law firms rather than lobstermen and that privately owned wharves and piers like Merrills need revenue to pay for long-deferred maintenance, such as dredging. 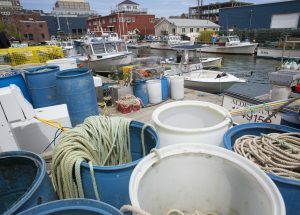 But fishermen depend on Portland Harbor for safe, sheltered access to the sea and other marine services, like the Portland Fish Exchange and local chandlery service, he said. Law firms and gastropubs can be built anywhere. The harbor commission likes the proposal – Chairman Tom Dobbins called it “an idea whose time has probably come” – and will consider adopting new rules to allow storage docks to be moored in the harbor along with boats and ships. Dobbins knows other Maine ports allow floating storage docks. Some, like Yarmouth, treat them like any other mooring; others, such as Harpswell, set different standards. He thinks Portland would want to regulate size, location, seasonality and total number. The commission may also consider whether the floating docks require liability insurance. Harbor Master Kevin Battle is meeting with the lobstermen to review their proposals. New rules would need the OK from Portland, South Portland and state Department of Transportation, as well, which would be a months-long process.